Glendale, Arizona is a thriving community for real estate; homeowners are looking at fixing up their properties to make them more valuable on the re-sale market. Over in Arrowhead, property values are even higher, so many people look to nearby Glendale to get a better value without sacrificing a great location. To make your property competitive in Glendale, you should make sure it is in great shape, including a healthy and attractive roof. Before you invest in re-roofing, you need to know what kind of roofing types are available. Perhaps the most popular roofing type is asphalt shingle. Shingle roofing in Glendale is relatively inexpensive and durable. The new architectural or “dimensional” shingles are much more attractive than the older standard 3-tab shingles. You can get it for an affordable price compared to other roofing types, and it will last an average of 25 years. It’s also easy to maintain, and shingles can be installed on just about any roof. Tile roofing in Glendale is perhaps the second most popular roofing type in Arizona. It is resistant to the intense heat, as well as the heavy rains and winds that are common to the monsoon season. In Glendale, tile roofing often has a terra cotta or earthen color to blend in well with the desert landscape. However, a range of colors are available. Tile is heavier and more expensive than shingle, but it is also more durable. Metal roofing is becoming more popular in Arizona and throughout the country. It can last 50 years or more, depending on how it is made and treated. Metal is energy efficient, and it is much quieter than most people would expect. Modern metal roofing is also very attractive and even sophisticated. Foam roofing is popular for both residential and commercial properties which have a flat roof. The foam is sprayed on as a liquid, and it dries hard. The foam forms an impenetrable layer that gets into every nook and cranny. It is waterproof and highly energy efficient. Foam roofing also lasts a lifetime if it is properly treated. There are other types of roofing, but these are the most popular. Before you start shopping for a local roofing company in Glendale 85310, you need to know what kind of roofing scams to avoid. Some of the most common scams involve roofing companies giving you inaccurate estimates. For example, the Glendale roofer may tell you that you need repairs that you don’t. The roofer may even go so far as to create damage to take a photo of it and show it to you as “proof.” Others may charge you for work that they don’t actually do. We’ve written more extensively about the types of roofing scams that are out there. You can read about them here. Dozens of roofing companies serve the Glendale, Arizona area. You can sort the wheat from the chaff by asking your friends and colleagues for recommendations of roofers they have worked with and liked. It is a good idea to look at online reviews. 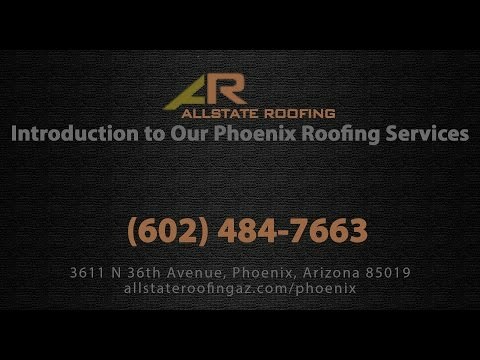 Allstate Roofing is a highly rated roofing company that serves the greater Phoenix area, including Glendale, Arizona. We are a full-service roofing company, providing both Glendale roof repair and re-roofing of all roofing types. Our experienced roofers will help you determine if repair or Glendale re-roofing is your best option based on the condition of your current roof, your property type, and your budget. Contact us today to get a free estimate for your roofing work.